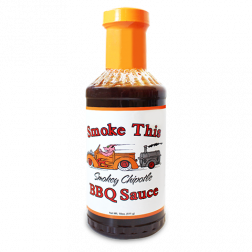 Smoke This Smoke this BBQ sauces were created by BBQ champions for BBQ teams and backyard enthusiasts alike. Made in Missouri, these award-winning BBQ sauces have made their way around the BBQ competition circuit and into the backyards of many. Smoke This BBQ Sauces' award-winning flavor has proven to win over BBQ competition judges and any BBQ lover who gets a taste of this top quality BBQ sauce. Ranging from smoky BBQ sauces to traditional Kansas City-style sauces, you’ll enjoy the championship flavor of any bottle of Smoke This BBQ sauce. 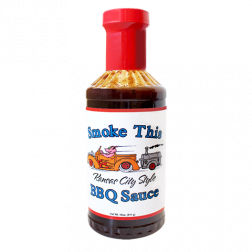 Smoke This BBQ Sauce Kansas City Style offers the traditional flavor of Kansas-city style BBQ sauce that turn any cut of meat into and award-winning masterpiece. Improve the taste of your BBQ dishes with the award-winning flavor of Smoke This Smokey Chipotle BBQ Sauce. It's the perfect BBQ sauce for chipotle lovers who are looking to achieve top BBQ results in backyard or competition BBQ.